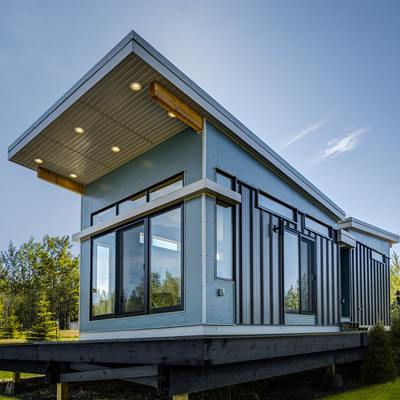 For some, park models are an alternate to a summer cottage, for others park models are the main and permanent residence providing a base from which to travel. Either way, park models help owners get more of what they want. Bruce Hunt from Winnipeg traded his 34-foot fifth wheel for a 40-foot park model with three slides. 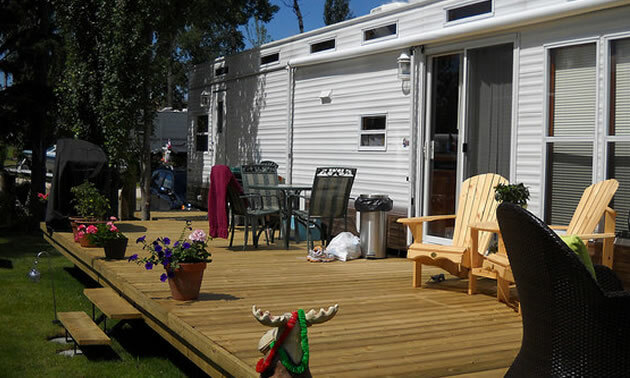 The fifth-wheel was always intended to be parked on their lake lot anyways, and the park model is easier for older family members to maneuver, everything being on one level. 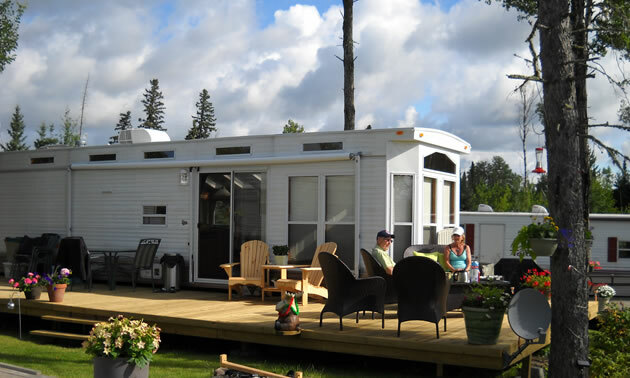 The Hunts are empty-nesters and use the park model as their cottage on Longbow Lake, near Kenora, Ontario. You'll find them at Redden's Campground from before May long weekend until after September Labor Day. "This is the cottage we can afford," said Bruce Hunt. Hunt's park model is 440 ft.² plus a deck along one side and the front of the home, which faces the lake. His lot is up high for a lovely view. He likes the social community at Redden's Campground: the spring pancake breakfast, the fall pig roast, the meals of pickerel and prime rib at nearby Smith Camps. Redden's is a two hour and twenty minute drive from his home in Winnipeg. This location allows time on the water fishing and boating. The campground has good access to the beach. Residents collect at the gazebo building to watch playoffs on the 60-inch screen, or soak in the ten-person hot tub, or steam in the wood-fired sauna in an out-building. "The best way to build something is to stand outside with your electric drill. Press the trigger and soon somebody wanders by and says, 'hey Bruce what are you building?' And your project is underway." Hunt joked. When the Hunts travel it's on two wheels. In fact, every year they take an multi-week motorcycle trip. When Rick H's employment status changed as a result of the price of oil slipping below 45 bucks of barrel he pulled the pin, sold the house in Calgary and bought a park model on Swan Lake near Vernon. When the snow accumulates enough to require shoveling he heads south for the winter. 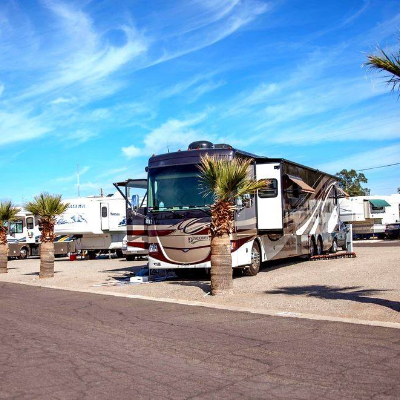 Having a park model as a permanent home makes is easy to take his motor home to Mexico. "We didn't think we could retire (early) in British Columbia but when we bought a lot at Swan Lake we could afford a park model. Now we take our motorhome to Mexico when the snow flies." Said Rick H., park model owner. Rick's park model suits his retirement lifestyle and income perfectly. The lighter investment solved part of the financial equation when compared a traditional home and lake lot. Both of these owners get more of what they want because of the park model. 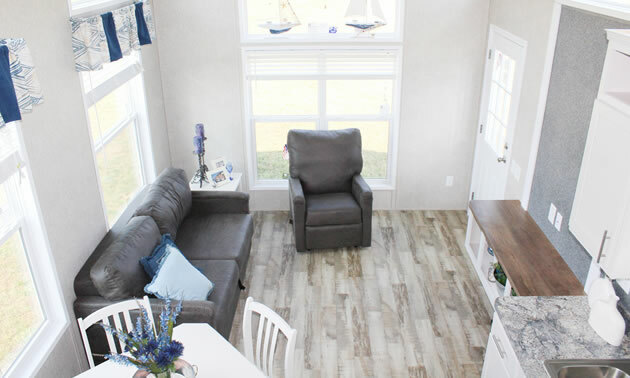 Bruce Hunt has the cottage-on-the-lake lifestyle he dreamed of, and Rick H, was able to bridge to his dream of retiring in British Columbia and having winters somewhere warm. "Park model living is a culture, it is a lighter financial investment. 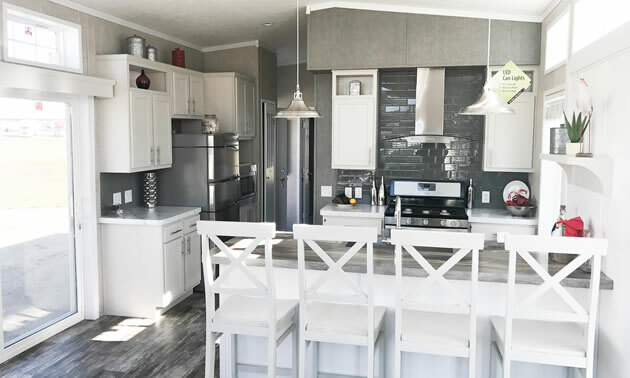 Park Model owners are simplicity focused, and mobile minded people," said Berni Bargen, of Sawatsky Group. The tiny house movement used to mean hooking up your RV for the next adventure—now it is a social movement. 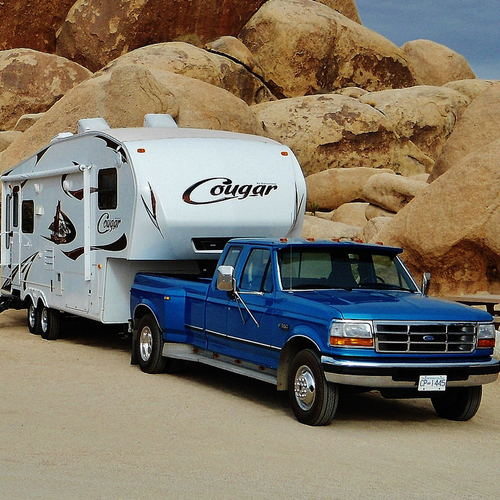 Learn the difference between a travel trailer and a fifth wheel to find the best option for your camping needs.